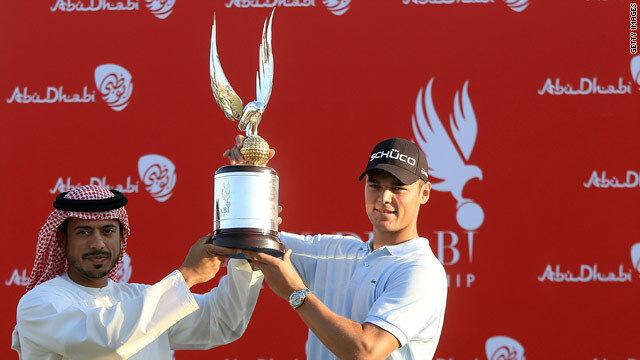 Abu Dhabi specialist Kaymer triumphed for the second time in three years after a final round 66. (CNN) -- Germany's Martin Kaymer won the lucrative Abu Dhabi Golf Championship for the second time in three years as he held off England's Ian Poulter to triumph by a shot on Sunday. Kaymer's birdie on the par-five 18th proved decisive, reaching the green with two fine blows then two-putting for his four. Poulter, who had been joint leader playing the final hole, had to lay-up and could not make a 15-foot birdie putt which would have forced a playoff. The third member of the final group, Rory McIlroy, carded a final round 67 to finish two shots back. Kaymer, who will move up to sixth place in the world rankings on Monday, carded a six-under 66 for a four-round 21-under 267. Poulter, who made a hat-trick of birdies to open his round, also carded a 66. Kaymer, who won in 2008 in Abu Dhabi and was tied second last year, said playing in the final group had been a real pleasure. "It was one of the nicest rounds I have ever played on the European Tour. In fact, they were four fantastic days. I hit the ball great and my putting was very good too," he told www.europeantour.com. "And as a group, all three of us played so good. It was very solid, and all about birdies. There was no letting up," he added. Poulter, who is also set to move into the world's top 10, was left to rue a missed opportunity. "It's a nice start to the season I guess. Of course, Im pretty frustrated that I've walked away shooting that score and I haven't won." McIlroy, who will divide his time between the European and PGA Tours this season, will defend his Dubai Desert Classic crown next week and knows he is in good form. "Good start to the season, last group and going down the last just one shot behind and getting the juices flowing again. Hopefully, this sets the tone for the rest of the season," he said. Shane Lowry, the Irish Open champion as a amateur last season, produced his best finish as a professional to claim fourth place at 17-under. Desert specialist South Africa's Louis Oosthuizen, who finished tied second with Kaymer last year, shot a 66 for fifth place at 16-under.